Welcome to the notecard I've been avoiding like the second coming of the plague. There are at least two fundamental options for viewing this work. ★Cruise through at your own pace & where mused savor salt at a visceral level. ★The more daunting version. The above plus all the damn yet potentially interesting Eliza notes that follow. As my primary presence Inworld is commercial, I’ve not engaged in the luxury of formal arts related work for quite some time, and certainly never on this scale. I had formerly mused the idea that if I was ever to engage in art again, then this odd creature called 'salt' would evolve, needless to say those originally indiscriminate ideas morphed into something entirely else during the course of actually creating it. Aided and abetted by a smaller project 'fourth position' I created on the fly for One Billion Rising earlier this year, which is woven into the foundation of sorts, though explored more expansively. This work is predominantly instinctual, much shuffling ensued, and therefore not tidy in philosophy. Perhaps problematic that I've been so enmeshed in the emotion of its creation that the premise of tying it up in a clever art historian-esque summary notecard type endeavors was always going to remain rather elusive to me. However this plays out, I had a moment of extreme personal catharsis during the creation of 'salt', and for that fact I remain grateful. Details in relation to this can be found in my comments regarding cultural influences other, in the secondary more expansive notes, if you're curious. 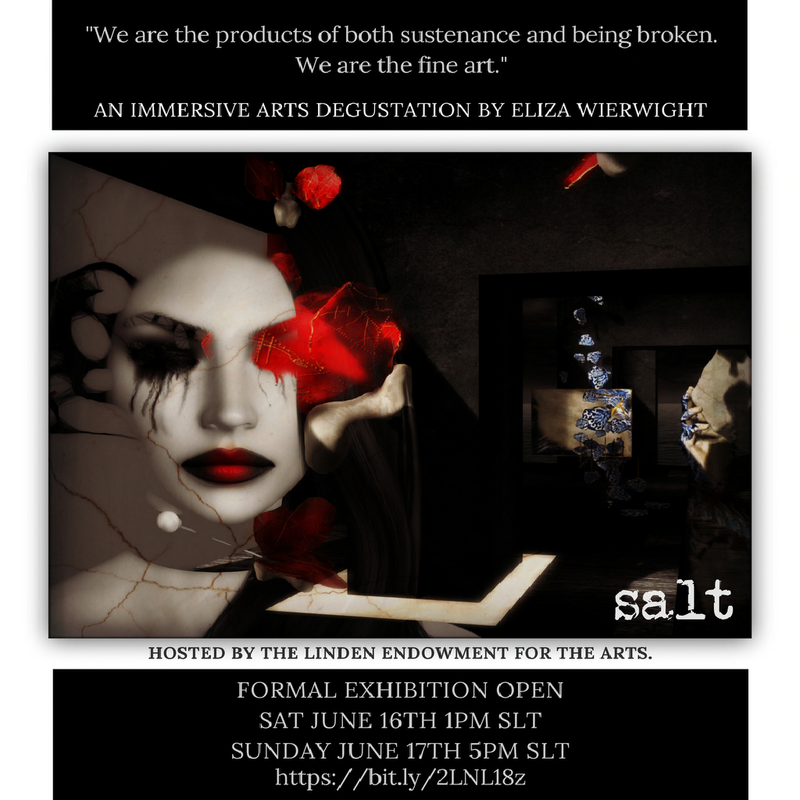 As a fuller Immersive piece the philosophy of salt presents this way, I invite you to consider the journey through the installation as experiencing-dining from a pre-set menu of somewhat unpalatable stories & truths. Some of my own, some not. Though all manifestly important to me irrespective of origin. I’ve quite deliberately misappropriating the term 'degustation', this imparted itself as an ideal transition, as each segment-course is a unique work of its own volition. There are however other threads that drift through the work, as I’ve permit myself a further interplay of symbolic references in relation to the accoutrements of sustenance. In the context of literal salt, a basic commodity that exists in most kitchens of the World, it became a metaphor for the things that wound us, a conduit. Another thread meandering through this work, relates to the Japanese philosophy of Kintsugi, embracing the unique, flawed or imperfect. Life ingratiates itself with such hardship at times. If we are the wounded, then let us embrace where possible those challenges & scars, and in surviving them or in our empathy for others that do, see ourselves as the beauty. We are the fine art.